An attacking midfielder who made his debut for the Saints as a substitute during City's opening day defeat at home to Dorchester Town. Spent the 2006-07 season with City's neighbours Stevenage Borough and also had a spells on loan to Welling United, Cambridge City and Diss Town. Started his career with Waltham Forest prior to having a couple of trial matches for the U18 Tottenham Hotspur side. Unable to hold down a First team place he joined Potters Bar Town. 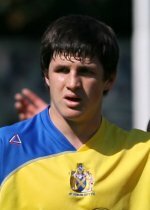 Returned to the Siaints for the 2008/09 campaign before moving to Weymouth.